I recently came across a cheaply priced booklet at a book sale about the large and diverse Acanthus family. For those who like informative books about ornamental gardening without the bells and whistles this little reference will certainly delight. The author extols the charms of the many ornamental plants of the Acanthaceae family, a large tribe best known by the well-known cool climate Acanthus or oyster plant. Apart from Acanthus, this family includes many brassy sub-shrubs, such as Justicia and Megaskepasma, that love frost-free warm temperate climates. While this booklet is aimed at a Sydney audience it will also appeal to gardeners in similar climatic locations around Australia. My only criticism of the recommendations was the lack of warning of the weed potential of some members of the Ruellia genus in this family. With the exception of Acanthus most of Mowat's recommendations are generally not available at most plant nurseries as when young these plants lack flowering charm. The author suggests sourcing plants at the excellent Friends of the Royal Botanic Gardens plant nursery in Sydney. It would have been helpful that other specialist nurseries selling these plants were listed. Despite a couple of minor gripes I highly recommend this booklet. Sometime back, I received a call from a Scottish woman asking for my gardening help. The lady - let’s call her Morag - asked whether I trimmed hedges as she needed urgent help cutting one in her back garden. I was asked to do the trim as her husband – let’s call him Don - was suffering from severe back pain and was unwilling to climb their wobbly wooden ladder. My first impression of Morag and Don’s garden was that it was immaculately maintained, and it came as no surprise when they told me that their garden was a regular entry in the ‘medium-sized’ category of their local council’s annual spring gardening competition. Don noted that they had entered the contest for several years but he was mystified why they had never won. What struck me was that while the garden was well designed and maintained none of their plant selections were distinctive or unusual and the garden was, quite simply, dull. 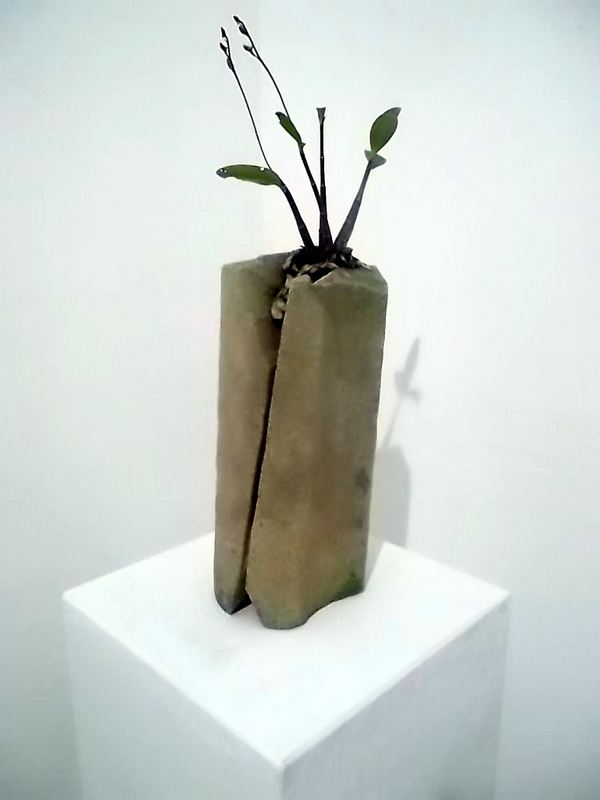 The only concessions to Art in the back garden were a couple of painted concrete sculptures of kneeling 'naked ladies' near the swimming pool and a composite stone head of Buddha. It was no wonder that in the garden judges’ collective mind this uninspired block was soon forgotten in deference for gardens with a touch of the inspired. Reflecting on this couples lack of success made me think whether it was possibly to create a distinctive garden from plants and pots totally sourced from supermarkets and hardware shops. Many people are increasingly buying their plants this way rather than from the traditional specialist plant nurseries. To answer this question I decided to view the offerings available in several local stores. Coles and Woolworth's are long established in Australia and have sold seeds, fertiliser and garden fittings for many decades and along with Kmart branched out into selling garden plants as a way to attract new customers into their stores. While most of their plants are not expensive their stock has gained a reputation as being in poor condition due to light deprivation and sparse watering regimes. Perhaps in reaction to this public perception most supermarkets have begun to abandon selling live plants over the last few years. Customers traditionally lured by one-off purchases and cheap plants found in supermarkets have increasingly moved to the nursery sections of the large hardware barns such as Bunnings. These large concrete box retailers have only been in Australia for a short time and based on experience in the North American market have set up nursery sections as a way to lure customers away from the supermarket sector and the traditional nursery trade. Early on the big barn nursery sections in Australia were poorly managed and the plants were in as dire a condition as the stock of their supermarket rivals. But, over the last few years the barns have got their act together and have learnt that plants have different display and maintenance needs to nails and PVC piping. The management improvement of these areas may account for the demise of the supermarkets foray into horticulture. Most of the plants found in the barn nurseries are well grown and generally in good condition but offer little to the serious gardener looking for something unusual. Despite the quality of the stock the variety is limited and like the hardware items found inside, the prices are not always cheap. Sadly, the trend towards large monopoly retailers has seen the demise of many small individual nurseries who offered expert advice as well as a comprehensive range of stock. While many plants can be found in hardware barn nursery sections, visits to specialist garden centres and plant fairs will certainly give your garden the magic touch. Making distinctive gardens doesn't necessarily mean having a bottomless budget, but it requires a genuine love of plants and the interest in finding a place for the unexpected, be it plant or sculpture. 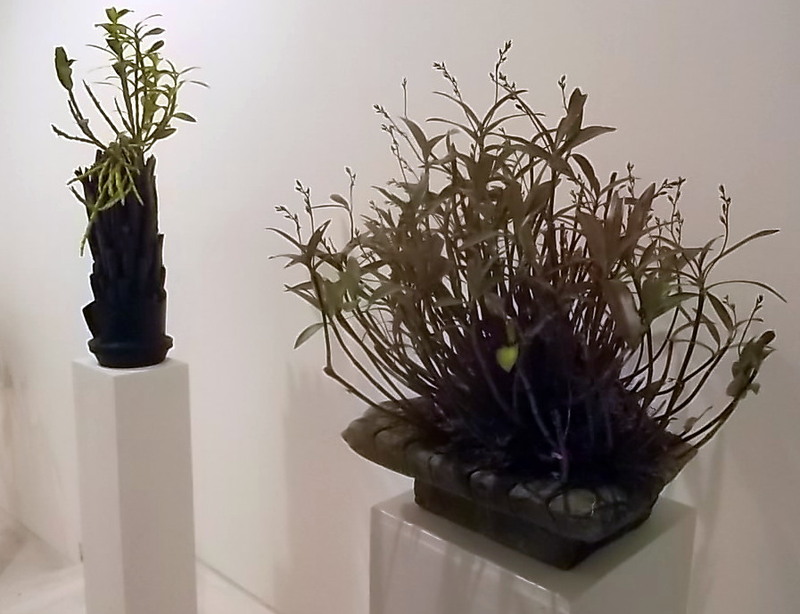 If only Don and Morag had explored the unusual in the plant and sculpture world they may have won greater accolades for their hard work. I'm interested in what you think about this major change in the way we buy plants. Is it a good thing? All my life I have loved flags and pennants even though I'm no nationalist flag waver. Most national flags are simple abstract variations of bold colour blocks, as in the French, British or German ensigns, while another popular design variant is the addition of celestial symbols such as the sun, moon and stars, as found in the flags of the United States, Australia, China, Japan and Turkey. Other designs include religious symbols, crests and weapons. As a plant lover I was curious to find examples of botanical imagery used in national flags. After some research I found there were surprisingly few sovereign state flags which fit this criteria. While floral emblems are more common in provincial or sub-ordinate political entities flags (such as Hong Kong or Australia's Northern Territory) they are absent from most national designs; perhaps floral imagery is not macho enough for a national symbol. Arguably, the best known national ensign using a botanical motif is the Canadian flag which was adopted in 1965. The central feature is a single leaf of the endemic sugar maple (Acer saccharum). While the colour is striking the leaf colour of this plant turns dramatically red prior to leaf drop in Autumn. After the Canadian flag, the best known flag using a botanical image is that of Lebanon. Their flag includes a stylised Cedar of Lebanon tree (Cedrus libani) at the centre of the design. This conifer is one of the most attractive trees found in nature and makes a fine choice for a national symbol. With all the tensions in that part of the world this symbol is loved and respected by all Lebanese be they Muslim or Christian. What more would you want from a national flag? Sadly, there are few other botanical examples apart from the Cypress flag which includes olive branches and the British Indian Ocean territory flag which includes a palm. I'm sure I've missed other examples. If I have please let me know. 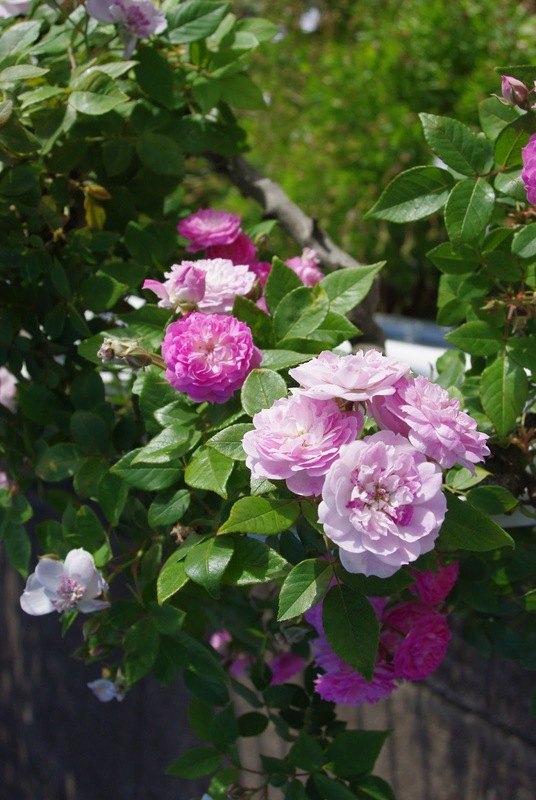 Mid to late July is the commonly accepted time to prune roses in warm temperate Sydney. While this is true for most roses there are many plants that should not be touched at this time. So before you get out your saw and secateurs you need to know what kind of rose you have. Common roses that can be pruned now include Iceberg, Queen Elizabeth, Just Joey and Peace. Not all roses should be pruned in winter. The most commonly grown roses found in our gardens are Hybrid Tea's. These are a group of shrubs which became increasingly grown during the last century. Originally favoured by florists for their superior blooms they soon became popular with home gardeners. In frost free areas these plants are best pruned in mid winter, but in colder areas their annual haircut should be delayed until early spring. Like surgery on humans, clean and sharp tools are essential for rose pruning as there is less chance of introducing diseases to the plant. Make sure you are protected from rose thorns with sturdy garden gloves and try to use some form of eye protection. Many are baffled on the right way to prune a rose bush but generally you should try to cut the plant back by about a quarter of its original size and concentrate on removing old stems and diseased foliage. After your prune try and spray with lime sulphur. When you have removed all the prunings take time to weed around the base of the plant. In a future post I'll look at the right time to prune other types of roses. Many gardeners enjoy plants simply for their individual form and beauty and don't care about knowing the botanical name. Sadly, I need to know all the names of the plants I grow, therefore I rely on plant labels to remind me of the common name as well as genus, species, and cultivar details. Despite my love of recording plant names I hate seeing plastic plant labels left on plants after they have been planted. These nursery tags not only look unsightly but in time cause damage when the plants grow around the wire attachment. So if we eschew the tags given to us by nurseries what kind of label should we use? I love the detailed labels used in botanical gardens. In the past these labels were large and detailed as can be seen in the old label shown above. This easy to see marker is perfect for large trees and shrubs but was expensive to make. In recent times botanical institutions have preferred cheaper and more discrete tags. While these smaller labels work well for garden staff they are frustratingly hard to see for garden visitors. Many a time I have traipsed over garden beds trying to find the name of a noteworthy plant. Trees need good sized labels which identify the plant by its common and scientific name. If the label is not attached to the tree passers-by may be confused over what tree is being sign-posted. One quirky technique is to make the label into the the leaf shape of the intended tree. For the home garden large labels are unnecessary and we can rely on more subtle methods. For shrubs and small trees I like to use aluminium or copper labels. These can be etched with the plant name by using a pencil. As long as the wire attachment is loose the label can stay on the tree for many years. Usually gardeners know the names of the plants we commonly use but may simply need a reminder on correct spellings and variety names. 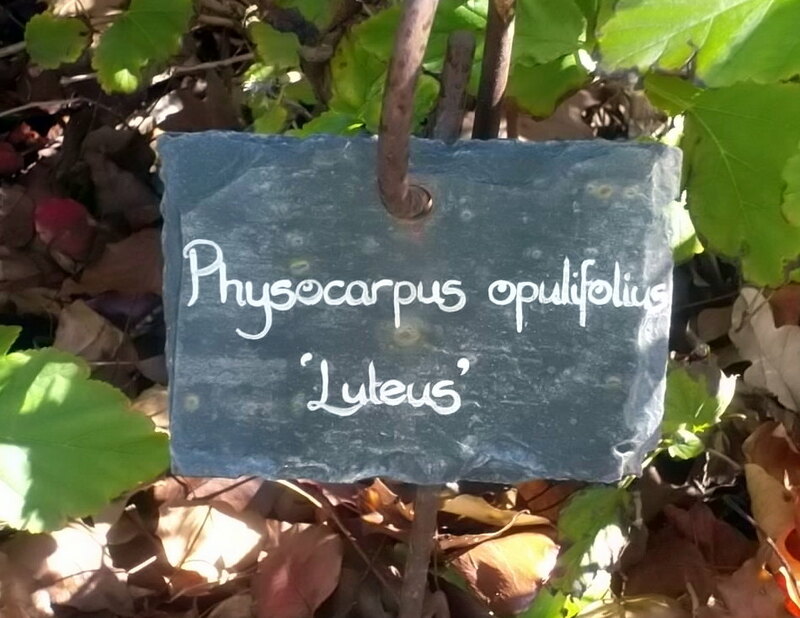 Labels are essential for bulbs and herbaceous plants whose foliage dies down during its life cycle. For perennials and and small shrubs I often don't label the plant at all and rely on recording the location in a note book. What's your preferred type of labelling? Like many students before me, I had to learn to identify a large and diverse range of plants during my formal horticulture training. As well as identifying the plants in tests, I had to write down the genus, species, variety and family for formal assessment by our lecturers. Marks were given for correct identification and likewise deducted for spelling and other stylistic mistakes. Although I didn't appreciate it at the time, these exercises taught me to be aware of botanical variations as well as learning the scientific language of botany. Now, many years later, I have learnt to enjoy repeating the many tongue-twisting names invented by scientists from the time of the late 18th century. Two personal favourites are Parthenocissus tricuspidata (Boston Ivy) and Ceratostigma willmottianum (Chinese Plumbago). While botanists and many horticulturists are happy to use scientific names this is not so with most home gardeners who find this elitist technical language as incomprehensible as the artificially constructed 19th century European language Esperanto. So why do we persist in using scientific names? The standard response given by horticultural educators is that there is only one scientific descriptor given to a plant while there are many different common names given to the same specimen; this, according to the educators, often leads to confusion. This is indeed the case with the east Asian climber Parthenocissus tricuspidata, which as well as being known in English as Boston Ivy is also called Japanese Creeper, Japanese Ivy and Grape Ivy. On a personal note, my parents once had this plant growing on the front of their home for many years and erroneously called it Virginia Creeper, an epithet given to another member of the genus. 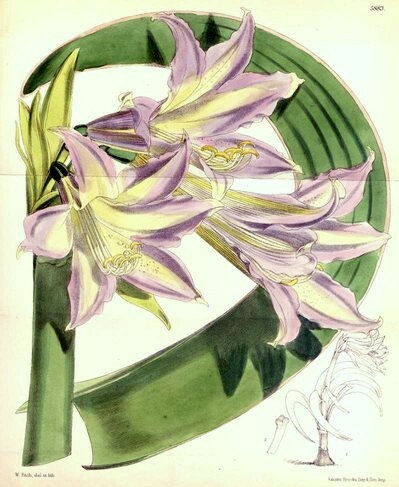 While it is true there is only one official botanical name given to a plant at one time it may have had many other scientifically sanctioned names in the past. Many of these were published in floras and in nursery catalogues and therefore persist to the present day. Many in the nursery world fall in love with a particular name and refuse to change labels whatever the scientists pronounce as correct. One of the few local botanists who have tried to unite the disciplines of botany and horticulture is Roger Spencer of the Royal Botanic Gardens in Melbourne. Spencer regularly writes articles for the trade press where he updates changes in the botanical names given to plants. It is best to speak of things growing about our doors in our own tongue, and the practice of using in conversation long Latin names, a growth of our own century, has done infinite harm to gardening in shutting out people who have a heart for a garden, but none for the Latin of the gardener. There is no more need to speak of the plants in our gardens by their Latin names than to speak of the dove or the rabbit by Latin names, and where we introduce plants that have no good English names we must make them as well as we may. While Robinson’s views are thought prevoking, his romantic perspective is somewhat naive. Whether we like it or not the persistent use of scientific naming in the horticultural world will continue well into the future. While it is important for botanists to inform horticulturists and gardeners of changes it is onus on the nursery trade to respond to these changes. If they don’t we might as well follow Robinson’s view and rely on using common names. In a future post I will write about the good and bad ways to label plants in the garden. While there are many fine gardens in the Sydney area they become thin on the ground when you move west of the Blue Mountains. One notable exception is Mayfield, located near the exotically named town of Oberon in the Central Tablelands of New South Wales. Mayfield is quite an unassuming name for this park-like landscape garden, and while the owners claim to be influenced by English gardens such as Cliveden and Chatsworth, Mayfield is much more in the style of grand-gesture French gardens inspired by Versailles. 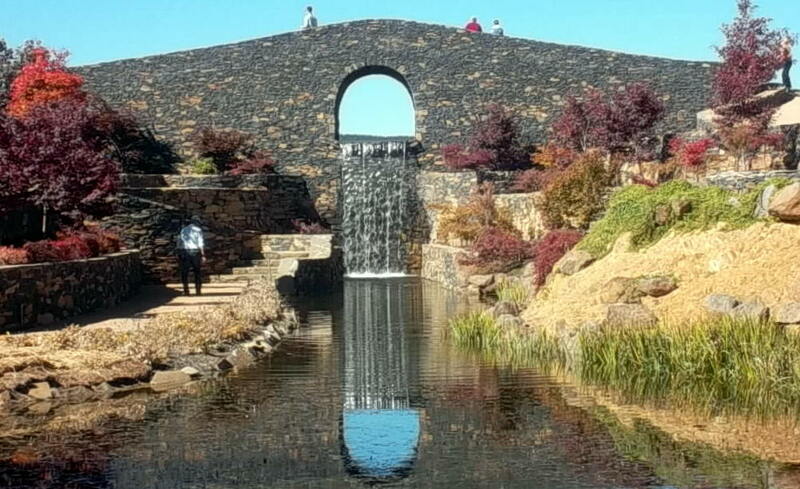 Therefore the grounds are filled with fountains, water features and formal clipped hedges. 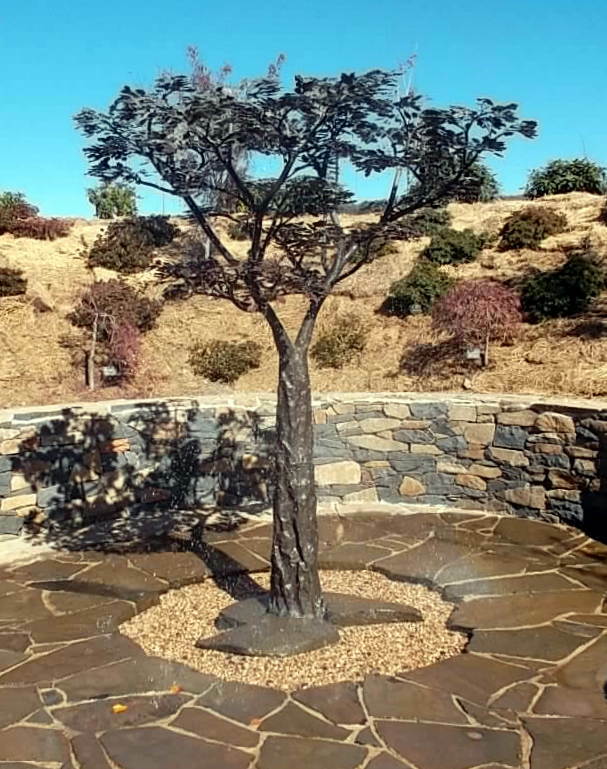 A dominant design feature of the garden is the mass use of locally sourced basalt rock which is used throughout the garden for the construction of retaining walls and steps. With an elevation of over 1,000 metres Mayfield can rightly claim to be a cool climate garden, and because of this the owner grows many plants and trees not normally seen in Australian gardens. The visitors brochure declares the garden as a 'botanical wonderland'. This is a big claim as I found the palette of plants rather uninspiring being largely dominated by standard landscaping favourites. Despite this, the garden includes some interesting mass plantings of maples, hydrangeas, iris and bulbs. 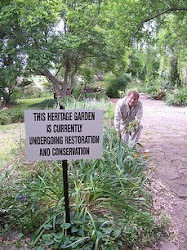 With the exception of the well maintained rose garden most of the plants in the garden were labelled. I particularly liked the choice of plant tags which were made of small rectangular pieces of slate. These labels harmonised well with the stone and the slate roofs of many of the buildings. Despite being such a large garden there was surprisingly little sculpture. One of the few exceptions was the recently installed water-dripping copper tree which was sourced from the Chelsea Flower Show in London. Every good garden needs something to lure the visitor back, and while the grounds at Mayfield were well laid out they lacked personality, a problem often found in recently established landscapes. I'm sure that in time the shrubs and trees will grow giving the garden a distinctive presence, but as the garden is young (established in 1999) the owners should find something that will entice the visitor to return, such as a museum, art gallery, sculpture park or musical performances. Despite some reservations I take my hat off to the owner and his team of gardeners and stonemasons for their hardwork and foresight. They are creating a distinctive garden in an area lacking in fine parks and gardens. Mayfield is open to the public for only 6 weekends a year in Spring and Autumn (check their website for future opening times) http://www.mayfieldgarden.com.au/ Be warned the garden admission charges are exorbitantly high ($25 cash only, in 2013), and the grounds are not suitable for the frail and those in wheelchairs. A moderate level of fitness (and a hat) is needed to enjoy the garden. One of the treasures of my library is a 1925 book on hedge making originally owned by my maternal grandfather. Garden Craftsmanship in Yew and Box by Nathaniel Lloyd (1867-1933) is a how-to manual for the construction and maintainence of formal hedges and topiary. Formal hedges made of european yew (Taxus baccata) and Box (Buxus spp) became fashionable in late 19th century grand British gardens and Lloyd's book reflects their popularity in the following century. While the text is minimal the book includes a series of instructive photographic images showing how to maintain the formality of the planting. Nathanial Lloyd based his garden advise on the hedges he laid out at his Great Dixter home in East Sussex, England, after he purchased the Tudor-era property in 1910. Many years later Great Dixter became world famous as the stunning garden of Nathaniel's youngest son, the provocative garden writer, Christopher Lloyd (1921-2006). 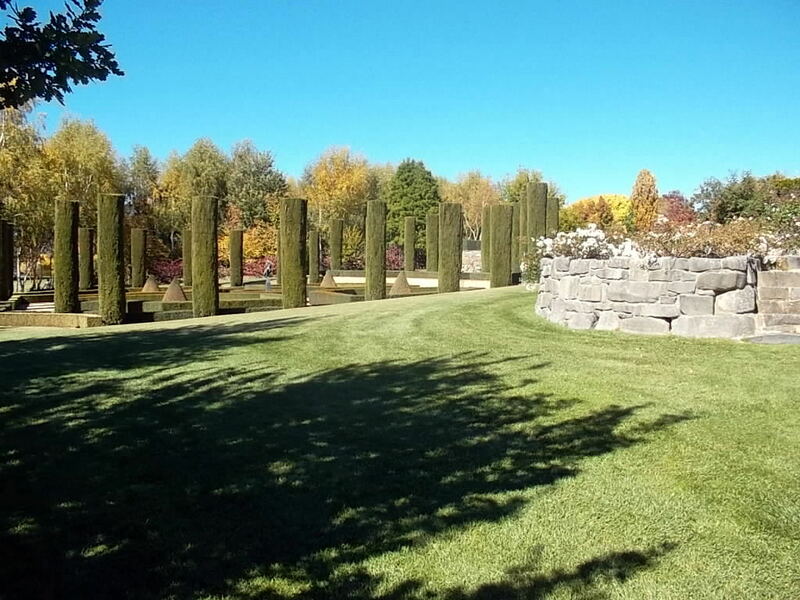 While the gardens originally laid out by Lloyd senior have evolved into a landscape dominated by flowering plants, many of the original hedge and topiary plantings from his time survive giving the current garden structure. Not everyone appreciated Lloyd's book at the time of its publication. One harsh critic was the garden writer William Robinson (1838-1935) who described the work as 'the poorest book that so far has disgraced the garden'. Robinson, a vocal advocate of wild or natural looking gardens despised the geometric formality that Lloyd's monograph advocated. Despite this criticism, Garden Craftsmanship in Yew and Box gives valuable textbook advice to gardeners keen to have neat well grown hedges. In future posts I hope to write more about hedges, topiary, Christopher Lloyd and the garden at Great Dixter. From low maintenance, sun-drenched, inner-city balconies to rural plants-man's gardens the hardy Sedum genus is a group of Northern Hemisphere succulent plants that should be included in every Australian garden. Tough as old boots these plants - commonly known as stonecrops - can withstand frost, strong winds, and intense heat. Last month my Sedum's survived 45 degree plus conditions in Sydney, while last winter, in my mountain garden, they managed -10c without complaint. An early advocate of the low growing sedum's was the influential 19th century Irish garden writer William Robinson who recommended them for use in rock gardens or grown under roses. While Robinson chose to ignore their use in Victorian carpet bedding schemes, these plants have maintained their popularity despite changing fashions in garden design. Thoughtful selection will find cultivars that will flower at different times of the year. My winter flowering yellow Sedum (pictured at foot of page) reliably flowers from mid-winter until early spring. One of my favourite stonecrops is 'Ruby Glow'. 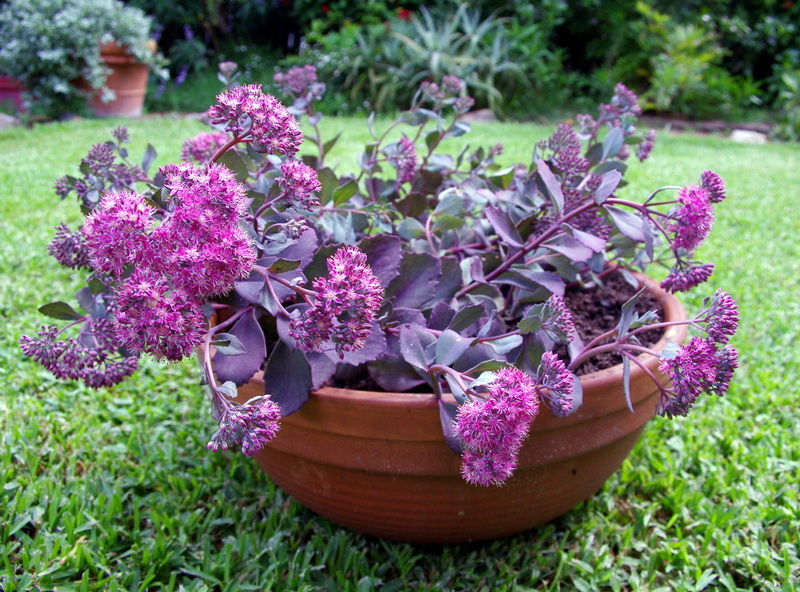 In late summer this attractive low growing plant produces lovely reddish-purple flowers which last until early Autumn. A similar variety is 'Bertram Anderson'. This cultivar also flowers in late summer but has darker foliage. Both plants look great in large pots. 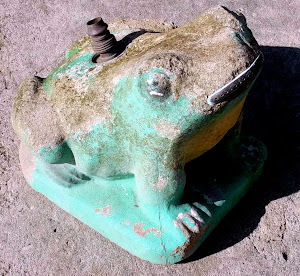 Apart from a sunny position and good drainage stonecrops need little care, and there are few pest or disease problems. Propagation is done by dividing the plant during dormancy in late winter. For those looking for more drama in their planting schemes, consider the taller growing stonecrops such as 'Autumn Joy', a plant much admired by the late garden writer Christopher Lloyd who found it 'arresting at every stage from bud to seed'. This is a plant best grown in garden beds rather than in containers. Can you recommend some other Sedum varieties? If so what time of year do they flower?